Hull prefabricated on the river Clyde in Scotland (Hull 15 at J & G. Thomson, Clyde Bank shipyard) shipped in pieces & assembled at Montreal. 45 x 120" stroke engine. 19 x 5'6" firebox boiler. Dynamited & sunk in deep water. 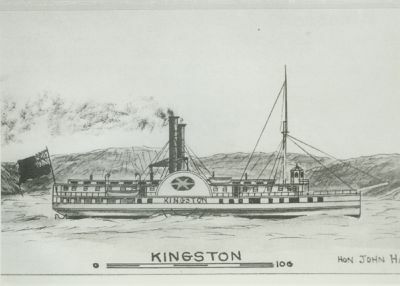 1855 Registered Kingston, ONT, ran Lake Ontario & St. Lawrence River passenger & freight. 1872, Jun 11 Burned at Grenadier Island; two lives lost. 1873 Rebuilt, Montreal, Quebec; renamed BAVARIAN. 1874 Rebuilt, at Kingston; 914 gross, 576 net tons, renamed ALGERIAN. 1912 Owned Calvin Co, Garden Island, ONT. Cut down to wrecking tug, 176.5 x 27 x 9.75', 588 gross / 304 net tons. 1913 Owned John Donnelly, Kingston.